BRIMSON flat Cable are manufactured for critical space requirment, protection against indefinite immersible in water under specified conditions, protection against rain water under specified conditions, protection against rain water and protection against ingress of small solid foregin bodies. BRIMSON'S Flat Cable are prouced from best quality electrolytic copper, annealed & bunched on automatic mnufacturing machines. The conductors are insluated with a special grade of PVC and outer sheath consists of a highly abrasion resistaant PVC compound. These cables are processed on sophisiticated twin extrusion line meets and withstands the demanding needs of submersible pump motor power supply. NO. & SIZE OF WIRES IN MM. BRIMSON Instrumentation cables ensure smooth Communication of low level signals from electronic transmitters to the control room. These cables effectivel cutdown any distortion or cross talk. Thesuperior Aluminium Mylar industries like Petrochemivals, Steel, Aviation, fire Alarm Systems, Refineries, Pharmaceuticals, Thermal Power Projects, chemical Plants, Transmission systems, Computer Controlle Electrical & electronic Equipments etc. Signal cables are imperative when you want to keep the signal to noice ratio and the capacitance to the minium in persence of stay magnetic fields. they are used in sensitive areaswhere accurate data inputsare necessary viz. eletronic Industries and Nuclear Power Plants. RTD (Remote Temperature Detection) cables carry temperature readings from remote or inaccessible areas to the contol room. The growing sophiticated of the electronic idustry continues to create a need for specially designed cables for use with computer-controlled electrical and electronic equipment. To satisfy requirments for impedance matching, lower bit error rates, lower crosstalk, longer transmission distances and high signal purity, we are manufacturing an expanding spectrum of instrumentation, daa and control cables in full purity, we are manufacturing an expanding spectrum of instrumentation, data and controlcables in full range of sizes, insulatings of different types, shields types for special installations. We can also armour these cables for mechanical protection. 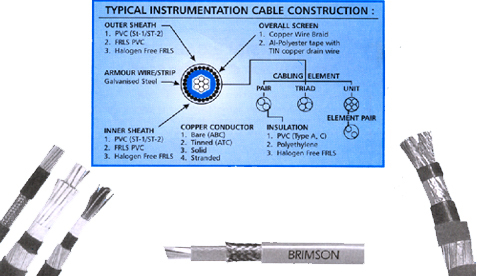 BRIMSON CABLES PVT.LTD. manufactures the widest range of shielded cables designed for control, power data & instrument circuits. When a particular installation is prone to interference from either internal or external sourced, some from of shielding in the cable is necessary. Even if one installs the most accurate and reliable instruments to monitor and control the system will be as strong or as weak as the cable interconnecting them. In shielded cables, ideally a coverage of around 85% is desired when providing braid shielding but it is often seen that the coverage is hardly in the range of 50% to 60% which leaves the cable exposed to all kinds of interferences. Moreover only an aluminium foil or braid shield on its own may not be effective enough to eliminate or reducehe interference problems, hence the need for Dual Screened Cable-wherein both an aluminium foil having 100% coverage (with minimum 25% overlap) in conjunction with shield is provided. Dual Screened is far more effective in the most demanding environments than ordinary screened cables. * Insulated with high grade PVC. * PVC insulation / H.R. * PVC sheath / F.R. / F.R.L.S. * Easy to handle and terminate. * Flame retardant, self extinguishing PVC. These cables can also be termed as instrumentation cables, since they are used for process temperature measurment. The construction is similar to paried instrumentation cable but the conductor material is different. Thermocouples are used in processes to sence temperature and is connected to the pyrometer for indication and control. The thermocouple and pyrometers are electrically connected by the thermocouple extension/compensating cables. The conductors used for these cables are required to have similar thermoelectric (emf) properties as that of the thermocouple used or sensing the temperature. The cables are manufacturing as perIS : 8784, ANSI-MC 96.1, BS : 1843 ENI, DIn : 43714 : 43-323, JISC : 1610-1981 and customers specification. COLOUR CODES AS PER VARIOUS STANDARD SPECIFICAITONS. Conveyors, Loaders and similar transportable m/c. b) FT4-5 core 3 Power cores with protective screen one unscreened plot clad around bare central conductor. c) F 16-5 Core 3 Power Core with protective screen with plot core laid around an elastomeric centre. Cross section range : 16 to 95sq. mm. a) FTD-3 core 3 Power core + pilot core + each core all 6 sq. mm. laid around cradle separatoe. a) P3-5 Core 3 Power Core + pilot core + each core around cradle separator cross section 6 to 35 sq. mm. a) PC1-2 Core cross section 2.5 sq. mm. - 4 sq. mm. b) PC2-3 Core cross section 2.5 sq. mm. - 4 sq. mm. a) PL1-4 Core cross section 4 sq. mm. b) PL2-5 Core cross section 4 sq. mm.